Cruise the Galápagos Islands aboard a small expedition ship to walk among giant tortoises, marine iguanas and sea lions; go kayaking or snorkeling; and share kid-friendly activities led by an A&K Young Explorers Guide. Arrive in Guayaquil to begin your Galápagos adventure. Settle into your hotel and relax. After a private welcome breakfast and briefing, depart for the airport and your flight to the Galápagos Islands. Upon arrival, you are met by your naturalist guides and escorted to a vehicle that whisks you to the pier to board ‘Eclipse,’ your home for the seven-night cruise at the heart of your itinerary. Nimble enough to access the Galápagos Islands, yet large and stable enough for safety, it is a comfortable expedition ship built for adventure, offering a stylish and relaxed atmosphere. ‘Eclipse’ is ecologically sound as well and has been awarded the “Smart Voyager” seal of approval by the Rainforest Alliance, certifying it as eco-friendly and socially responsible. After settling in, attend an introductory briefing and a fitting for your wetsuit and snorkeling gear. Lying about 600 miles off the coast of Ecuador, the Galápagos Islands are a haven for some of the world’s most varied wildlife. It was this diversity that first led naturalist Charles Darwin to propose that species evolved in response to their environment. Darwin’s work also helped to alert the world to the need — urgent even in his own day — to preserve these islands from degradation by humans. Today, tourism to the Galápagos is closely managed, protecting the wildlife and allowing you and your family to experience the environment much as Darwin did. Because weather, water and wildlife conditions are subject to constant change, your islands itinerary is not fixed, but two daily excursions are planned to the main sites and islands. Explore landmarks such as Punta Espinoza on Fernandina Island, El Barranco on Genovesa Island, Pinnacle Rock on Bartolome Island and the Charles Darwin Research Station on Santa Cruz Island. Each cruise day begins with an early breakfast; A&K arranges for healthy children’s meal-time menu choices and plans sightseeing at a pace that is right for young explorers. You then board a sturdy rubber raft called a panga for the morning shore excursion. 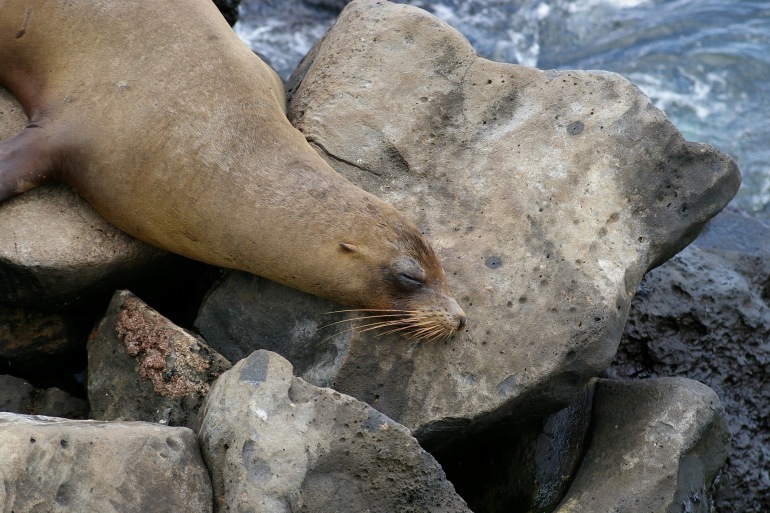 On shore, take photographs and confer with your naturalist guide, as you observe sunbathing sea lions; skittering Sally Lightfoot crabs; tangles of marine iguanas; and amusing blue-footed boobies, as well as penguins, finches and terns; even a century-old tortoise diligently trudging over the sand. Return to ‘Eclipse’ for a refreshing lunch, followed by time at leisure to nap or socialize on deck. The onboard Young Explorers Guide will engage young guests with scavenger hunts and other games. Keep your binoculars close by for a possible sighting of whales or seabirds. In the afternoon, return to the pangas for the second excursion of the day, perhaps with an opportunity to swim, kayak or snorkel. You may meet face to face with a water-dwelling inhabitant, such as a curious dolphin or sea lion stopping by to inspect the visitors to its equatorial home. Back on board ‘Eclipse’ for the evening, there is time to shower and relax before gathering in the dining room for another wonderful meal. In the evening, attend a lecture by one of your guides or explore the mysteries of the night sky with a fascinating astronomy lecture on deck, or gather for cocktails in the lounge to cap a day of extraordinary discoveries once the young ones are asleep. After a leisurely morning, disembark your cruise and board your flight to Guayaquil, and then transfer to your hotel. Later, share the highlights of your inspiring Galápagos experience with fellow guests during a farewell dinner at your hotel. After breakfast, transfer to the airport to board your homebound flight. Child Pricing | Children under 18 sharing with an adult save $800. Pricing applies to children under 18 sharing with an adult. This journey contains some active elements. Minimum age is 4 years. At the heart of your Galápagos experience is a vessel built for adventure, ‘Xperience.’ Cruise the islands and discover the wonders of this incredible region, returning each afternoon for leisurely lunches and each night to your comfortable, spacious cabin. Xperience’ combines the amenities of a first-class yacht with the skilled personnel and ecological practices of an expedition vessel. At 210 feet long, she carries just 48 guests in 24 spacious cabins. That means more room to stretch out. A small group size also ensures better service, with 31 crew members, four naturalist guides and an A&K Resident Tour Director at your service throughout your voyage.